"May I show you our SkyCeiling?" an animated Bill Witherspoon inquires of a passing group of physicians. The somewhat sci-fi setting of this query is the entrance to a 20-foot-high pyramidal booth in Chicago's cavernous McCormick Place, where 70,000 radiology health professionals have gathered for the Radiological Society of North America's (RSNA) annual trade show. "We create authentic illusions of real skies," Bill continues, gesturing skyward, as the doctors enter the pavilion. The doctors collectively "ooh" as they realize that the product in question is the 14-foot diameter backlit sky ceiling hanging above them. It is magical—an exquisite image of a real, deep blue high-mountain sky with soft wisps of clouds and branches of pink hawthorne blossoms. Four years ago Bill Witherspoon launched Fairfield's Sky Factory, creator of SkyCeilings and Luminous Virtual Windows, photographic illusions of nature that trigger genuine relaxation and well-being. Merging the power of technology, the beauty of art, and the healing properties of nature, the Sky Factory is Witherspoon's latest project in a career of more than 40 years spent exploring the intersection of art and nature with a scientist's discipline and an entrepreneur's visionary zeal. The RSNA doctors gazing at the SkyCeiling listen intently as Bill continues. "Just as a magician manipulates our habits of perception to make us believe that a rabbit has magically appeared from inside a hat, we create compelling illusions of real sky that trigger genuine psycho-physiological relaxation responses for viewers," Bill continues, gesturing broadly with upraised arms. "You have to experience the patient's perspective," he says, helping one of the physicians into a recliner. Bill explains the SkyCeiling system—its sophisticated daylight-balanced lighting system, high-resolution photographic reproduction, and three-dimensional supports, all of which make it look like a real architectural skylight. "Think about your patient coming in for an MRI," he continues. "They are anxious, maybe facing a dire diagnosis, and we want to do everything we can to help them relax, to feel at ease during the procedure. Having a portal to a beautiful sky above helps provide relief, a sense of expansion, and triggers a genuine relaxation response." The doctors appreciate the logic and the aesthetics, ask about pricing, take brochures, and move along to several more days of booth hopping. And Bill? He's back in the aisle, inviting people to view the SkyCeiling. Over the next several days, he continues to speak to hundreds of people, touting the marketing edge that a SkyCeiling brings to a healthcare facility. Bill is a consummate salesman when he believes in what he's promoting. After a college career studying arts and science, Bill spent six months in the high Oregon desert observing and painting the sky. In the early '70s he gave thousands of lectures nationwide and implemented a national public relations campaign promoting meditation. Since his youthful explorations, Bill has founded six companies, raised tens of millions of dollars in venture capital, founded a biotechnology research institute with Jonas Salk, directed the establishment of one of the first international genetic food-testing companies, led an adventure tours business, completed six public art projects with combined budgets in excess of $1 million, and helped to raise four children. His land-art projects in the '90s sought to synthesize his experiences of inner and outer nature, using art to elicit the beauty inherent in its deepest structures. The first of these, the Oregon Desert Sri Yantra created in 1990, was meant to be private. Discovered by an Air National Guard jet pilot, the desert design became a brief national sensation, and led to Bill's larger land art projects in the desert, as well as collaborations with farms in Iowa. While Bill's art projects served as a laboratory for exploration, The Sky Factory has truly synthesized his lifelong engagement with art, nature, and entrepreneurship. Not only does the company bring nature's healing qualities to healthcare facilities, homes, and corporate boardrooms, but it is also pioneering leading-edge organizational approaches. The Sky Factory has adopted the transparent Open Book Management system, a flattened employee hierarchy, a stimulating algorithmic bonus program, and an employee ownership plan—all of which set a foundation for the highly informed group dynamic that pervades the company's culture. "The Sky Factory is a great place to work," says Jeff Johnson, one of two Sky Designers who interface with every client that places an order. "The company is growing and we are totally in touch with every financial aspect of our progress, including whether we're on target for a bonus. We work pretty hard, but the atmosphere is cool, we have fun, and it's a terrific group of people." Bill's organization of The Sky Factory, especially the implementation of the Open Book Management system, reflects his fearlessness, idealistic faith in people, and willingness to apply the principles of clarity, transparency, and integrity that he has observed operating in nature. So far, it's worked. Launched on a shoestring and now shipping products internationally, The Sky Factory has tripled its sales in each of the last two years. Bill is the first to mention that the success of The Sky Factory is achieved by the collective focus and hard work of the people he's brought on board. "A company is the employees," he says. "The most important thing that a business owner does is hire the right people, get the very best people 'on the bus,' and then take the time to get them into 'the right seat on the bus.' After that I'm just a member of a great team." 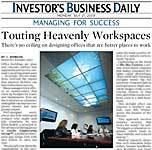 For several years the company's primary marketing has been showing its SkyCeilings at various healthcare and architectural tradeshows. The bulk of orders comes through tradeshow contacts, and Bill feels strongly that people are sold when they can see a SkyCeiling in person. This led the company to create, from scratch, a mobile gallery dubbed the SkyMobile, which has begun touring the Midwest, visiting hospitals, clinics, architectural firms, and public venues. The 25-foot-long custom trailer, wrapped in graphics depicting an old brick factory with sky and clouds inside the windows, houses a couple of SkyCeilings and Luminous Virtual Windows. On its maiden tour several weeks ago, members of Cedar Rapids' Economic Development Council, along with architects and hospital administrators, gave it rave reviews. Bill relishes life on the road, pulling the SkyMobile with a big Dodge dually pickup. He'll sell SkyCeilings, he'll evangelize on the business and human benefits of Open Book Management, he'll give SkyCeilings away to needy public institutions, and he'll discuss the preservation of our fragile atmosphere with interested researchers. The SkyMobile is Bill's latest adventure, taking his artistic and entrepreneurial vision on the road. Back home in Fairfield, though, Bill intends to continue building a great company, one that thrives on constant innovation, growth, and experimentation. He expects The Sky Factory to flourish for many years to come, and hopefully inspire others along the way.